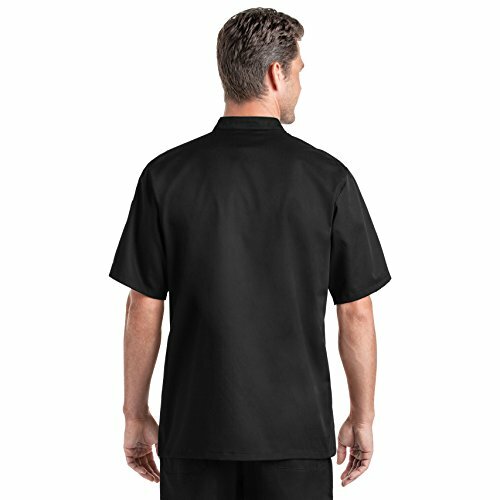 This On The Line collection Men's Short Sleeve Double Breasted Chef Coat is comfort, quality and value, all bundled in one. No matter what industry you're in or the need for this chef apparel, this coat is well-made and gives you the best value at a competitively lower price. 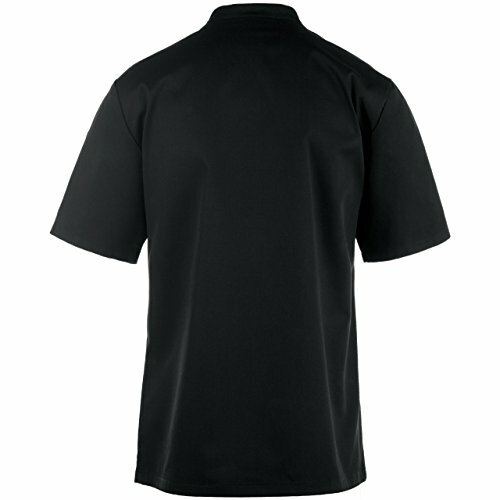 Made of 65% polyester 35% cotton fade resistant premium fabric blend with a tailored fit. This coat includes short sleeves for comfort in any kitchen, plastic buttons for durability ready to take on all the action your shift or event brings, a reversible front closure giving you the flexibility to wear your coat your way, a chest and thermometer sleeve pockets for functionality and storage, and a tailored fit creating a look that doesn't get any more professional than this chef coat. 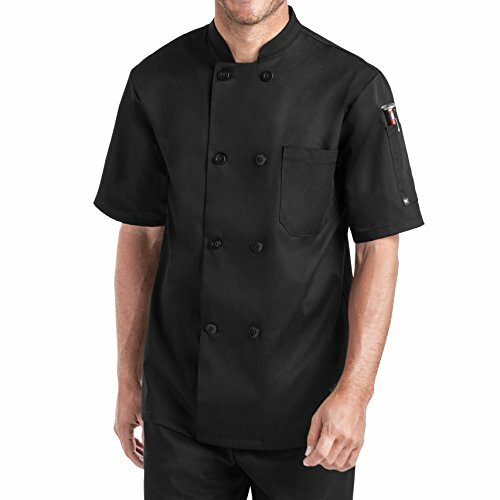 To help complete the look of this chef wear or uniform, this coat is available in 2 fade resistant solid colors to coordinate with any attire or match any standardized uniform requirement. The approximate length for size Large (L) is 30.5". 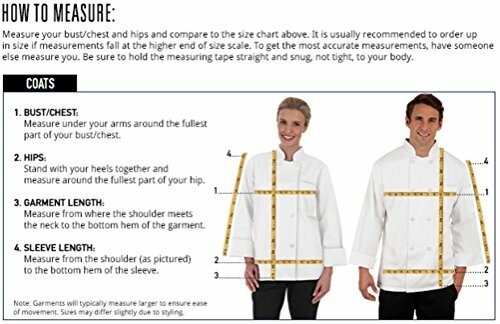 Please refer to the additional product images that contain our size chart and measuring instructions to help determine your best fit. TAILORED CLASSIC FIT: This chef coat/jacket is men styled and fitted for durability and comfort ensuring this coat works as hard as you do without the hassle. This coat features short sleeves, plastic buttons, reversible front closure, a chest and thermometer sleeve pockets, and a tailored fit creating a look that doesn't get any more professional than this chef coat. GREAT QUALITY: This coat is made of a premium blend of 65% polyester and 35% cotton that feels great and look good. These are made with food service professionals in mind. FADE RESISTANT COLOR: This coat is available in 2 popular solid colors that are fade resistant to coordinate with any attire or match any standardized uniform requirement. EASY TO CLEAN: Machine wash this chef coat with similar colors and tumble dry on low. If needed, cool or hot steam iron. 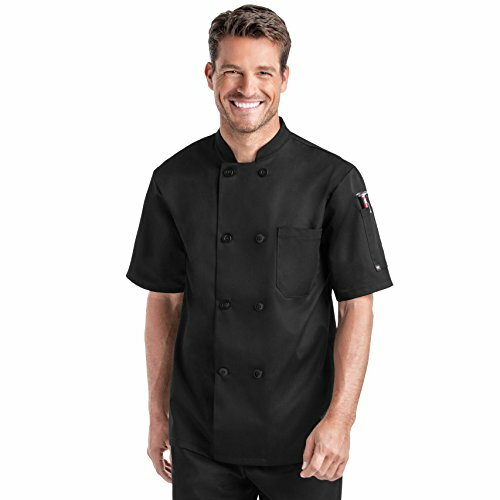 EXCELLENT VALUE: This Men's Short Sleeve Double Breasted Chef Coat is comfort, quality and value, all bundled in one. Chefs, Line Cooks, Caterers, Counter Servers, Expediters, Directors, Managers, Students, etc. ; all find this coat affordably priced and available in a wide range of sizes perfect for all food industry professionals. Click 'Add to Cart' now to join the list of satisfied buyers!